The only thing I can say with clarity, is the life of a mother/freelancing journo/producer/bad farmer/student/aide/occasional band manager certainly keeps life interesting. The endless parade of farm jobs aside, the thing about working in regional Australia is the need to find as much work as you can to make up for the fact that there really isn’t a lot of it around and when it comes, it’s often intermittent and generally lower paid than urban areas. So whether it’s on your own farm or somewhere out of the front gate, life can become a juggling act, and like all balls flying through the air, somewhat unpredictable. For five years after we moved here I did the weekly commute down to Sydney to the ABC. When I became a mother, I left… the commute didn’t seem very viable with a baby in tow (! ), and after 11 years there, I needed a break. A few freelance stints and another baby later, I thought I’d best get serious again by finding gainful employment. Unable to find any locally, I decided to retrain as a primary school teacher (following the slow and steady mantra as this remains ongoing). The insurance enquiries added to my momentum – “certainly madam, we can help with a quote… What is your occupation? Sorry, did you say, stay at home mum? Sorry, we can’t insure you (ie. you are worth nothing). What about your husband? He’s a musician, you say? He’s in the high risk group due to the dangers involved in stage diving.” You’ve got to be kidding me. 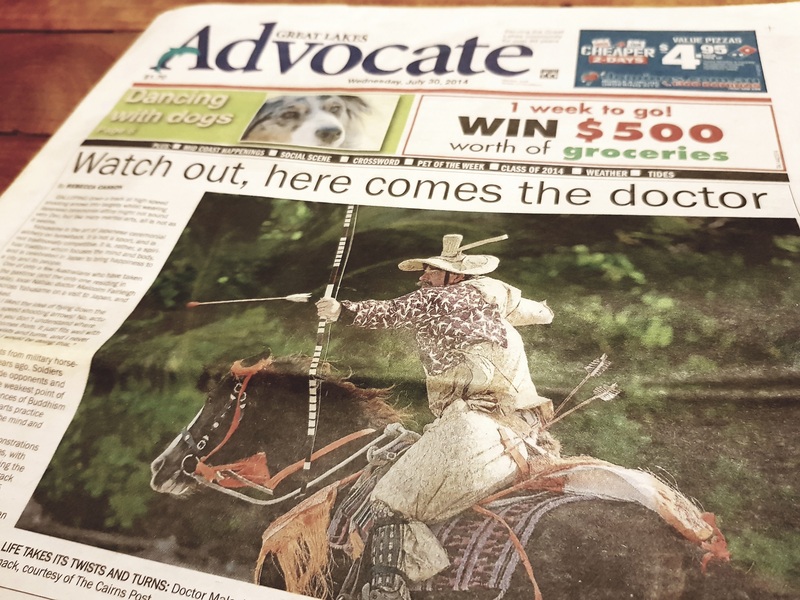 My first (and favourite) front page headline, featuring Nabiac’s former GP Dr Fairleigh who had a rather unusual hobby – Yabusame, the art of Japanese ceremonial archery on horseback. Photo courtesy of The Cairns Post. And so I hit the job circuit, commuting up to Port Macquarie’s ABC Radio station to fill in for six months, following that up with a fulltime job at Fairfax’s local papers. For both, my learning curve was steep and rapid! Little lost William Tyrell remained in the news while I was in Port, and I dreaded those few occasions when his headline landed on my shift. Later, upon my successful application for the journo job at Forster, I unexpectedly ended up instead ‘temporarily-for-10-months’ as the only journo in Gloucester. With (the now abandoned) AGL’s coal seam gas plans irrevocably dividing the community, that was one baptism of fire. Back to Forster, by then I had prematurely burnt myself out to-ing and fro-ing and elected to go part-time. I lasted another eight months before I resigned a year ago. Despite the excellent company working hard around me, I was feeling the stress… “Hello, can I speak to your sports department please about a weekend event? How about your photography department? What’s that – you don’t have one? What do you mean it’s just you and another journo? How many stories do you think you can properly research, write, edit, photograph, publish online and layout in just 3 days work for a 40 page weekly paper?”… (OK. Admittedly the two last questions were mine). So it turns out I am obviously not a mother who can do it all. The career ladder has definitely passed me by. And that’s OK, I’ve made my choices and am at peace with them. And fortunately, where one door closes, another always opens. Complementing my current path to teaching, I have been working at our local school as an aide; I undertake minimal farm work (suffice it to say we are downsizing our herd to … nil… for awhile… in an effort to minimize the risk of getting up in the middle of the night to get them off the road… ummm…. thanks for doing that last time, Dougal! ), am attempting to get up some freelance writing stories… and importantly, I have also been fortunate to work on The Artisan Farmer. So, while it is always awkward to promote your own work, I am going to make an exception here (hope you don’t mind Bec H). In an effort to celebrate all those who have made brave choices in their lives, whatever they are, however big or small, whether it works out or not, I am transparently cross-promoting because as a Two Becs reader I think you will enjoy The Artisan Farmer concept. Obviously I’m keen, for many personal and community reasons, for it to succeed (but feel free to skip through the intro / outro of the films though – it never gets easier watching yourself on screen! )… Who knows, you might even learn something? And in a year when you’re heading up the Pacific Hwy needing some refreshment or a leg stretch, you could even consider a stop-off to sample The Artisan Farmer first-hand. In the meantime, feel free to hit the Follow button on your way out from The Artisan Farmer webpage as I shan’t cross-promote again – I don’t want to take advantage by crossing the invisible but ethical ‘blog to blog’ line too often! In the meantime, you can find me either at school, in the car, in a paddock, on band matters, behind the camera, writing, or in my ‘edit suite’. As for Two Becs In A Paddock – I’m back. But until I find time to do a bit of whipper snipping now that most of the cattle have gone, we might need to rename ourselves ‘Two Becs in an Overgrown Paddock? What say you, Bec H? PS – apologies for the length of this. There was a lot to say, and I’m not known for my brevity! This entry was posted in Farming, General, Life in a small community, Living with animals, Music, Uncategorized, Vegies, fruit and flowers and tagged artisan farmer, freelance, media, mid north coast, Nabiac, regional NSW, rural jobs, teaching by Bec C. Bookmark the permalink. Brilliant Bec. Yes, cross-promote away! The Artisan Farmer is such a fabulous project, let’s spread the word. While I laughed reading this, simultaneously I felt exhausted as I re-lived your recent employment journey. Phew! Here’s to part-time work when you have so many balls in the air. Thanks Bec… Hope I don’t drop any! Fantastic, Beccy. The promotion of the Artisan Farmer is so worthwhile and I cannot wait to sample their products! I believe your Video interviews of the Artisans would make a super T.V. series! Here’s hoping? Elaine. Spoken like a true mother. Thanks Mum! Wow Bec , I always ‘wondered what you did up there on the hill’ . Now I know; not too much as you are too busy running around the surrounding countryside. I never really wondered at all as ever since I met you I’ve thought what an inspiration you are and how incredibly creative , resourceful, good humoured and marvellous you are . Great story – Thankyou for sharing . I wonder what you’re next adventure will be ? Goodness Deb – who on earth are you talking about?!!!! Thanks so much, think I’ll print it out and blue-tack it next to my bed. Feeling pretty chuffed right now. Right back at ya! The article on the doctor who enjoyed practicing Yabusame must have been fun to write! Yes, my first print feature story!